A number of years ago I assisted a friend in clearing out her mother’s estate. 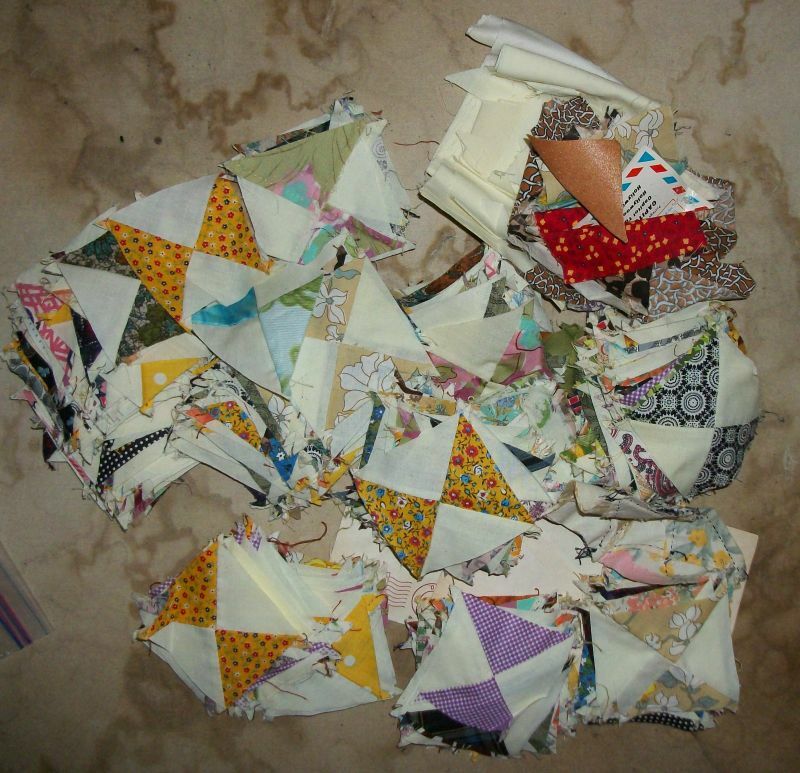 I was given a bag of hand-pieced vintage hourglass blocks. They’ve sat in my stash, waiting for inspiration to strike. This past spring, I pulled them out and counted. Not enough to make a quilt on their own, but I came up with a plan. 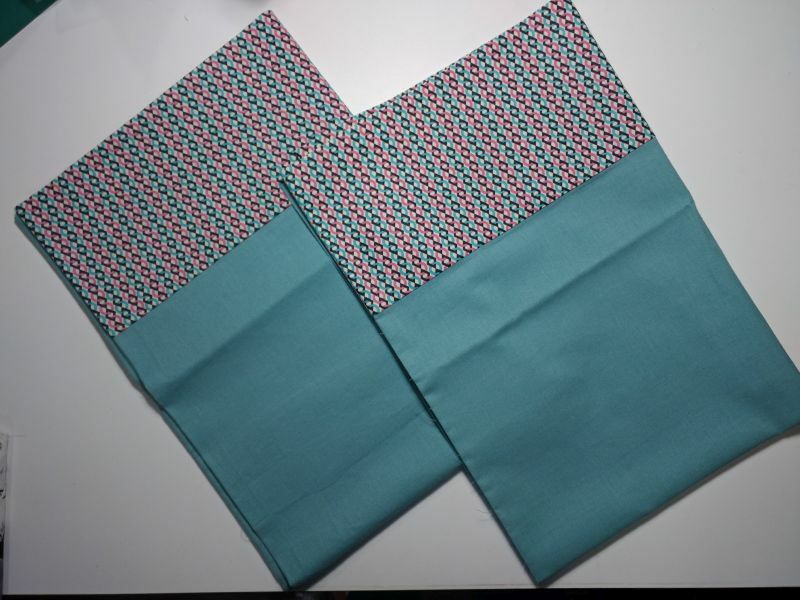 I purchased the mint green fabric on a strip to Springfield with my husband in April or May and started hand piecing the blocks. Each block needed the stitching line drawn on it as they were not all exactly 3″ unfinished. Fortunately, all of the edges were on the bias, so I don’t have to worry about the pieces raveling. I only made part way through the second round of mint green before I realized that there was no way my wrist was going to be up to finishing it by hand – at least not more than one or two blocks a night. (I fixed this). I took the bag of hourglasses and what I had pieced to the Mississippi Quilt Gathering in June where I took a class from Bonnie Hunter. She reminded me that Finished is better than Perfect and there is no law that says I can’t finish the top my machine. I still needed to draw the stitching line on the blocks, but I ended up finishing the quilt top by machine. There was no question about how I was going to quilt it – it had to be done on the machine. The only question was what I was going to quilt. In my mind I saw continuous curves in the hourglass blocks and feathers in the solid. But it’s been a while since I have done any free motion quilting and I had no idea how to tell my sisters computerize machine how to do what I wanted. 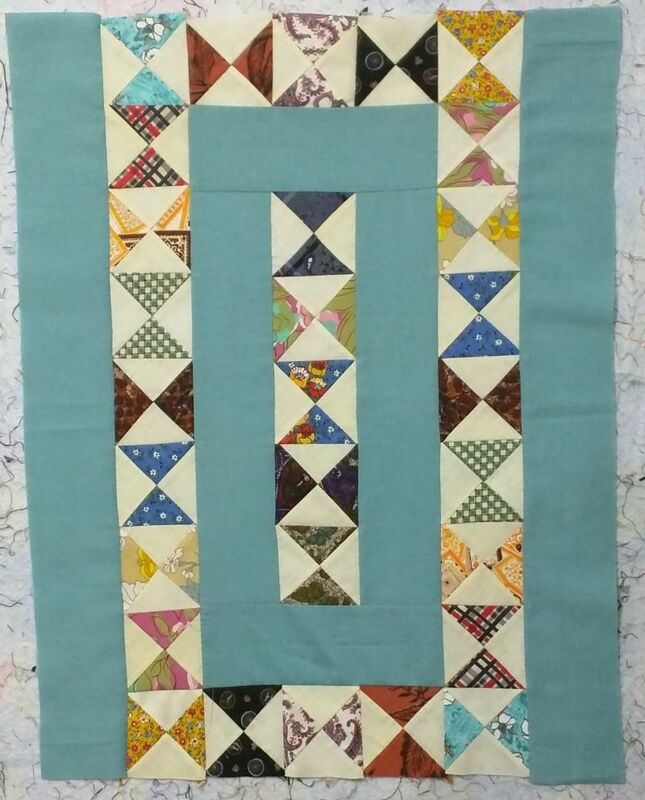 In the end I did the curves in the pieced blocks, half feathers in the outer border then echoed them a couple of times. In the center of the quilt I did a loopy thing. For the backing I used a piece of vintage fabric I found in my stash. Here is a better picture of the backing. 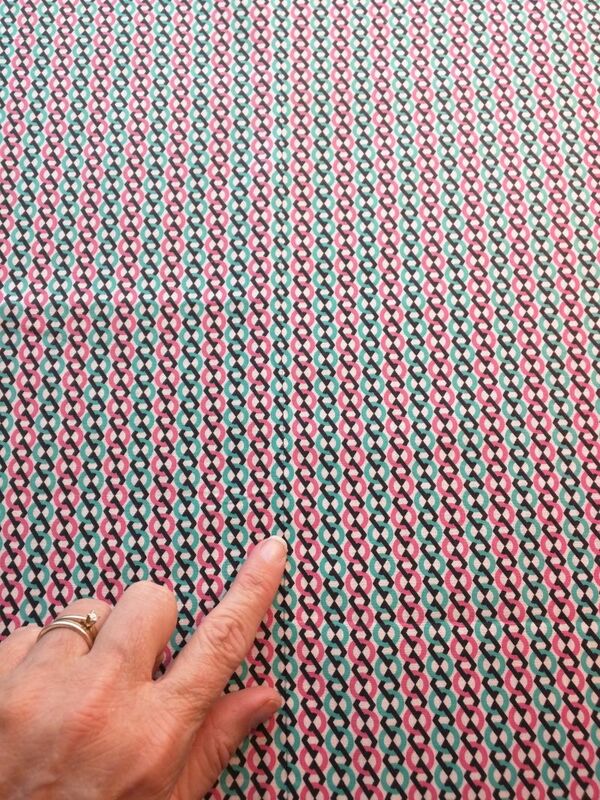 Due the small symmetrical pattern, I was able to match the center seam. 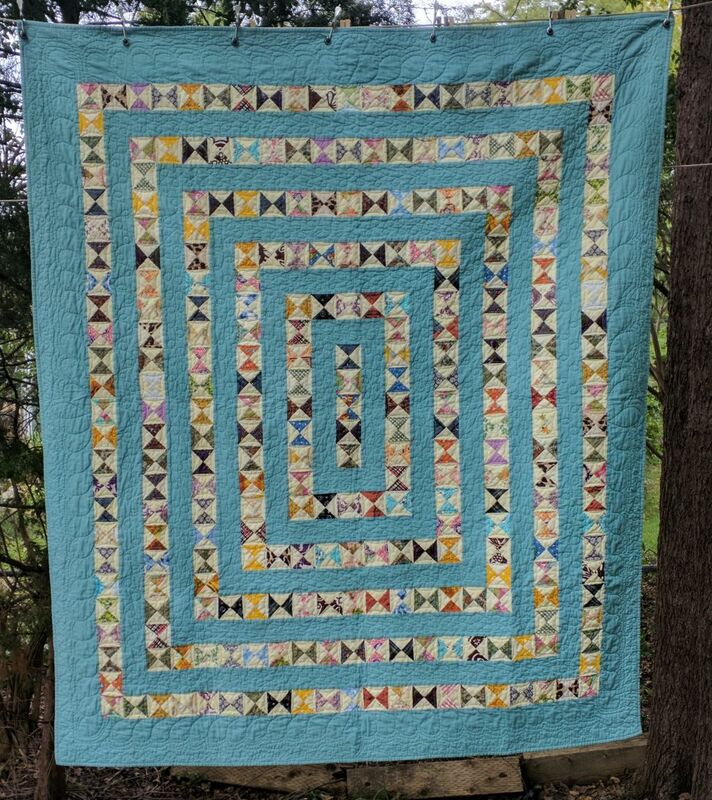 I used 80/20 batting from Hunter’s Heirloom Quilting and when I washed it, it scrunched up and feels like a vintage quilt. But as cool as all that is, there is one more bit of news. 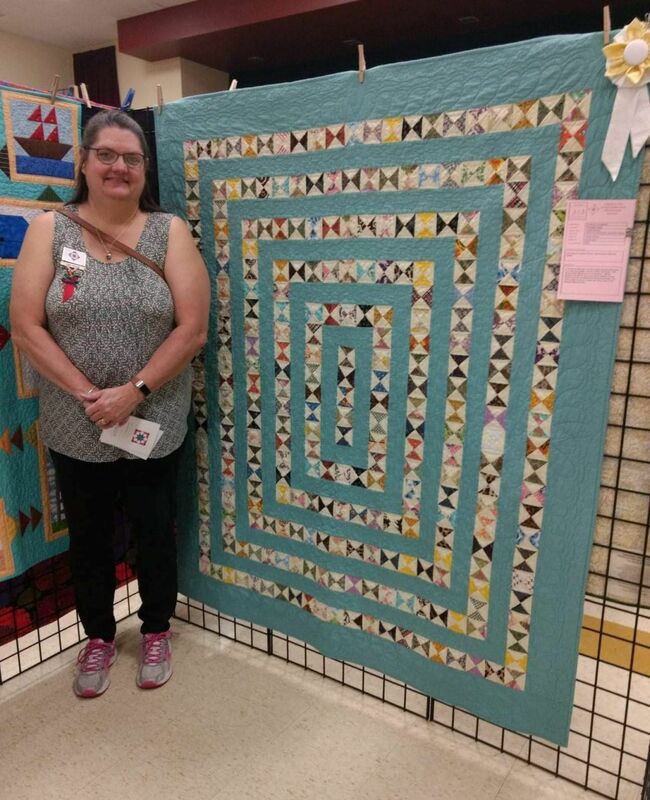 I entered the quilt in my guild quilt show. When I arrived the guild president called out “Congratulations!” The quilt placed 3rd in Best of Theme — A Stitch in Time. Since I got it home, I’ve made a couple of matching pillow cases. I still need to make the permanent label and wash the cases, then I’ll be able to deliver the quilt. 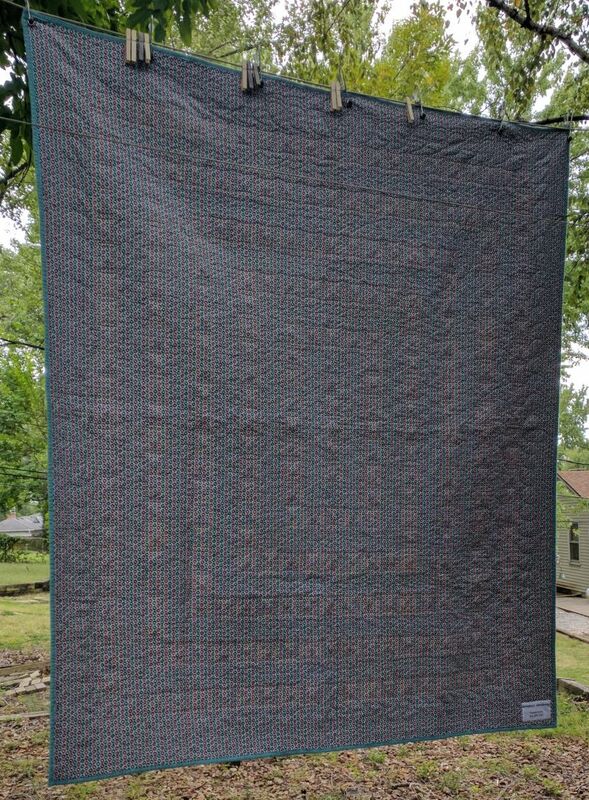 The quilt measures 60 1/2″ x 69 1/2″ after washing. I started it 5/6/2018 and finished it 9/18/2018. Pam, very, very pretty. I love the look of Traditional Quilt patterns. You did a great job.